After spending some time at the Parowan Gap earlier in the day, we continued south to the Arizona Strip. 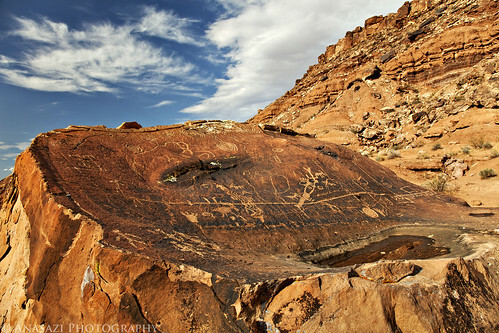 Our next destination was to visit the petroglyphs on the boulders at the base of Little Black Mountain. This was one of the more unique panels at the site. It appears that this boulder contains a natural pothole that holds water which might be why it was an important place. The top of this boulder contained more petroglyphs than the others in the area. On a side note, this is the first rock art site I have visited in Arizona, which also means I have visited sites in all of the four corner states this year.